These days, it is quite common for many people to play various games on their smart phones. As phone technology gets sophisticated and more advanced every day, more and more smart phone models are having the capability to let users play cutting-edge and graphic intensive games. However, eye strain is usually one of the common problems most smart phone owners encounter when playing games on their mobile devices, especially if their phones have small screens. It can even be more complicated if they are inside a moving vehicle. Fortunately, there is now an entertainment device that lets you play the games on your smart phone through a bigger and much clearer screen. 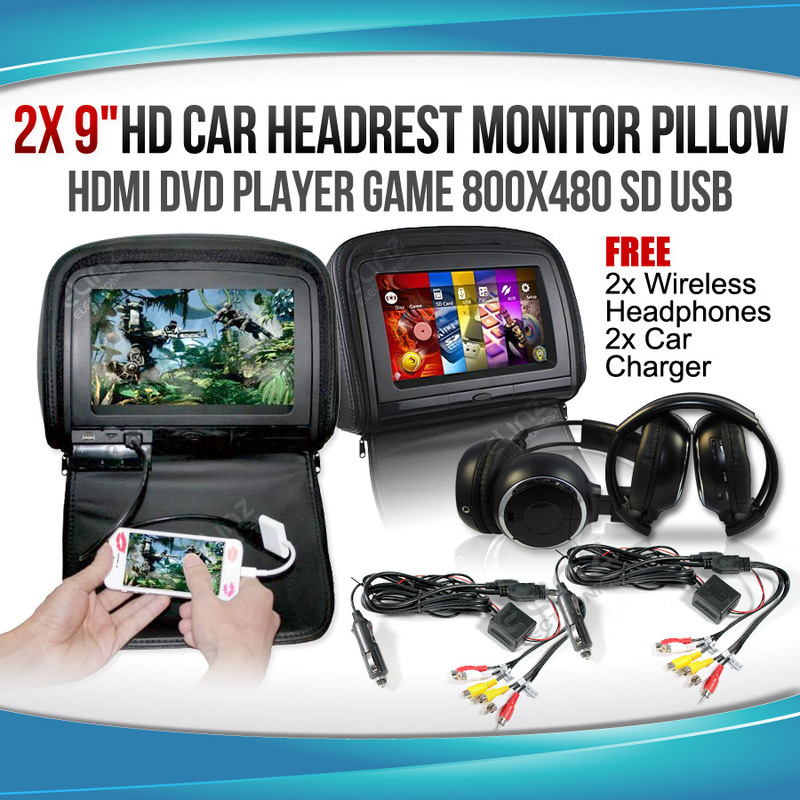 Presenting, the Headrest 2x 9" HD Car Monitor Pillow HDMI DVD Player. This headrest HDMI DVD player is a revolutionary car entertainment system that lets you connect your smart phone through the built-in HDMI port so you can have an excellent gaming experience while on the road. Now, you don't have to suffer from headaches and eye strain because you can enjoy your games on a crystal clear, 9-inch high definition widescreen. Playing smart phone games on the HD9HDMIWPCL is not the only thing you can do with this DVD player. Thanks to its built-in HDMP port, you can also share music and movies stored on your smart phone with everyone you're travelling with. Whether you have a new funny video to show your friends or if you want them to listen to new tunes on your phone, you can easily do this via the headrest DVD player. Of course, this is still a DVD player, so its main specialty is to let you watch your favourite movies while travelling. But unlike other car DVD players available today, this device is equipped with a high-quality, genuine Sony laser lens. This original Sony lens helps prevent scratches on your precious DVDs, especially the expensive and rare ones. It also stops movies from annoyingly jumping from once scene to another. Aside from DVDs, the device can also play other multimedia files like MP4s, MP3s, DivX, and AVIs. The DVD player comes with a headrest car monitor pillow design for a sleeker and more organised look. But if you're worried that this device will look out of place with the interior of your vehicle, don't fret. It will definitely match your car's interior as it comes in three colours to choose from: beige, gray, and black. If you're an avid gamer and you're looking for a top-quality entertainment system for your car, the HD9HDMIWPCL will certainly do the trick. With a bigger HD screen and numerous key features, this DVD player will certainly make your road trip a more fun and exciting experience. Check out Elinz Electronics today and find out what makes this revolutionary car entertainment system a must-buy.